Denon has finally revealed more details, specs and pictures on the DVD-3800DB Blu-ray player , and DVD-2500BT Blu-ray disc transport. 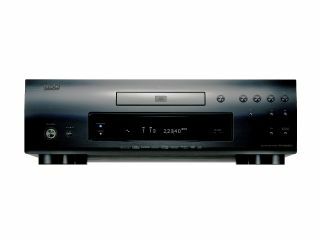 The company says its taken the time to do Blu-ray right: which means that both the DVD-3800DB player and DVD-2500BT disc transport are built for performance not price. They also adhere to the latest Blu-ray standard - BD-ROM Profile 1 version 1.1 . This is the so-called 'Final Standard Profile' for Blu-ray that comes into force on Thursday 1 November, rendering older machines obsolete. The DVD-3800BD also scores a notable first in that it's the world's first Blu-ray player to use Silicon Optix 10-bit Realta chipset. It combines pixel-by-pixel image rendering with digital noise reduction to clean up even Blu-ray video signals. Plus it also enhances the quality of other sources like DVD by up-converting and scaling their video output. Naturally the DVD-3800BD doesn't stint on sound quality either. Denon says features built-in Dolby Digital Plus , Dolby TrueHD and DTS-HD Master surround decoders, with performance enhanced by Denon's own Advanced AL24 processing technologies. The player also comes with 7.1-channel analogue audio output, and PCM audio output via HDMI too. The DVD-3800BD also comes with a secondary audio and video decoders which are used exploit the interactive features that are part of the BD-ROM Profle 1.1 spec. This enables you to enjoy interactive audio and commentary or even picture-in-picture functions along with your movie, and even take advantage of content like trailers and gmes downloaded from the internet and stored on SD card. Denon's Blu-ray announcements have so far been limited to the US release only and even then some things are still in the air. We know, for example, that the US version of the DVD-3800BD will cost $2,000 (£1,000), although no price or specs have been made available for the DVD-2500T Blu-ray disc transport. As for the European models, all we know now is that UK equivalent of the DVD-3800D will be available in silver with black as an option and that it will launch some time in November. We expect to get a lot more detail at the IFA consumer electronic show in Berlin, which runs from Friday 31 August to Wednesday 5 September - we'll be there to bring you full coverage.